Every time I start to feel like I need to do all the writing, and do it all now, I am going to click on this post because the advice Tansy Rayner Roberts has shared with us this week is awesome. Seriously. Tansy is an award-winning — and prolific! — author of fantasy novels, novellas, and short stories. Power and Majesty (Book One in the Creature Court trilogy) won the Aurealis Award for ‘Best Fantasy Novel’ last year (and if you haven’t read it yet, go! Read! It’s such a fun book!) and The Shattered City (Creature Court, Book Two) has just been nominated for this year’s ‘Best Fantasy Novel’ AA. Plus, her fantastic boutique collection, Love and Romanpunk, has been nominated in this year’s ‘Best Collection’ category, including a story that’s been given a nod in the ‘Best YA Story’ category! Meanwhile, Tansy somehow also finds the time to read voraciously and bring us all loads of spec-fic news with Alisa and Alex as part of the Galactic Suburbia podcast. It’s the piece of advice I dole out most often to my friends. Some of them have learned to recognise the look on my face, and chorus it with me, because it’s not the first time I’ve said it to them. I’m sure there are people in the world who need advice on how to think bigger, and grander, how to take their tiny, hesitant plans and turn them into something epic and world-beating. But I don’t have many friends like that. My friends tend, on the whole, to be crazy ambitious people with ideas too enormous to fit into their heads. The kind of people who beat themselves up because they’re not doing EVERYTHING RIGHT NOW. Not just the writers, oh no. It works as writing advice, but it’s also good advice for life. Sometimes, the goal is just too big, and you can’t get there today. So break it down into small, achievable goals. One of the hardest things I ever did was to get back to writing after my first baby was born, and my PhD had finally been put to death. I couldn’t write the way I had in the days before my life changed so drastically, and it was hugely frustrating. So I took on a challenge of tiny bites, which was to write 100 words (of anything) every day for 100 days. If you missed one, you started again. It seemed like a ridiculously small thing to try to do. I had novels to write, lots of novels, and I wasn’t going to get my career back on track with 100 words at a time, five minutes a day. But it was exactly what I needed. There were days when I wrote a lot more than 100 words, but there was something so deeply satisfying about hitting that target, regularly, which gave me my confidence back. And of course there were days when I forgot until just before bed, and hauling myself back to the laptop and chipping out those words before I let myself sleep made me feel like a superhero. These days, whenever the balance of parenting and writing and editing and TIME THERE IS NO TIME FOR ANYTHING gets too much for me, I try to breathe, and hit my targets, and keep moving, one small and achievable goal at a time. It doesn’t always work, but it keeps me on my feet, and some days that’s enough to count as a win. Tansy Rayner Roberts was first published at the age of 20 back in 1998 with a comic fantasy novel called Splashdance Silver, which won the inaugural George Turner Prize. 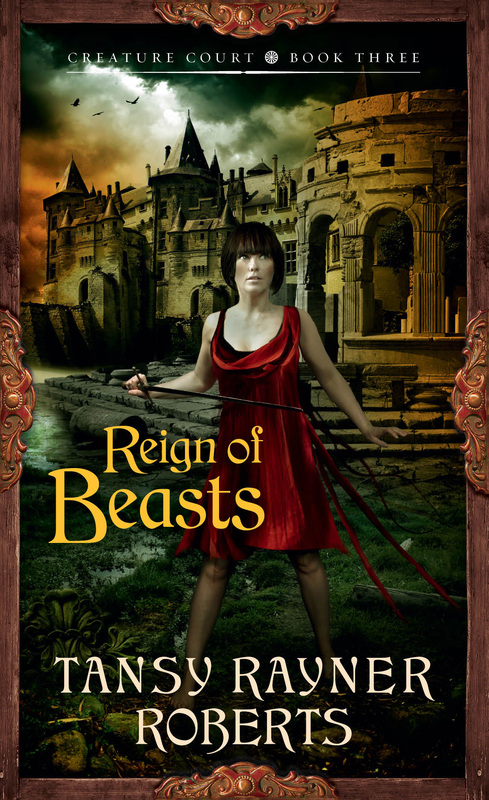 Her recent book releases include The Creature Court (Harper Voyager), Love and Romanpunk (Twelfth Planet Press) and the Siren Beat half of Siren Beat/Roadkill (Twelfth Planet Press). She is currently working on a novel about Nancy Napoleon, the heroine of Siren Beat. You can visit Tansy’s website here or tweet her @tansyrr. Tags: tansy rayner roberts, tuesday therapy, writing advice. Bookmark the permalink. Previous post ← Aurealis Awards Finalists Announced!